With all the updates here recently by HTC, what does everyone think the chances are that the Evo Lte gets the update to 4.2 & sence 5? But why search when you can create a new thread? Zookeeper63 and TonyLibations like this. That thread is talking about a completely different update. Why comment uselessly when you can skip over this thread entirely? It is, indeed, annoying on forums when people don't look or search and just create lots of duplicate threads. Seems to happen on every forum of which I participate (which is several). Conversion is then split into multiple places, making it harder and more work to follow, and making future searching more irritating. Oh well, ain't never not nothin' gonna change. Yep, different thread that's why if both searched for "4.2 Sense 5" they would have found the correct thread. Telling someone to search is an unacceptable response to a members question. Plain and simple. balansboy and kronosqq like this. 1000% agree, what's unacceptable is all the nit picking! Please, let's answer the question, add something to the question, or simply move on! Mikey47 and top magoo like this. I have read about a possible update in August, mostly rumors. We shall see. My next phone will be the Nexus 5. I've become very spoiled with my Nexus 7 tablet having pure Android and always being up to date. Chances don't look good at this point. 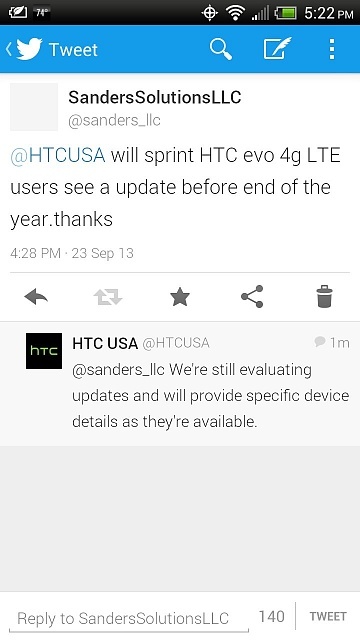 I asked that question in regards too a update coming and here a tweet from HTC. How to install the new gs4 update?